Never again be unprepared! 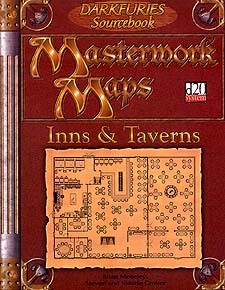 This volume of Masterwork Maps showcases 71 floor plans of fantasy inns and taverns, includes a massive and diverse array of ready-to-use characters, provides a multitude of colourful menus for medieval food and drink, and contains complete information of furnishings and building construction. Every establishment and personality is described, and many are expansively detailed.